[Updated] The Department of Conservation Services is looking into the death of a mallard duck at Spittal Pond, with an appeal being posted on social media to identify a man following the duck’s death. 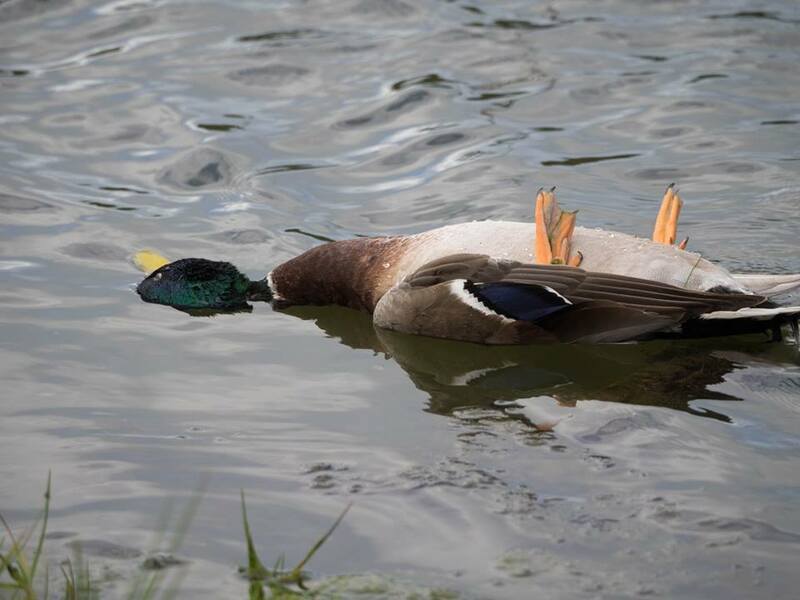 The post included a photo of the unidentified man as well as a photo of the dead duck, as pictured below. Photo via the Bermuda Audubon Society’s Facebook page. We asked the Department of Conservation Services for additional information on this matter yesterday, and will update as able. Update 2.41pm: The Department of Conservation Services said, “The matter is under investigation and it is therefore not appropriate for us to comment at this time. What the duck is wrong with that guy? who r the 3 Aholes who hit ‘dislike’!!! it’s a well known fact that people who are cruel to animals 99.9% are physically abusive to humans. mostly pedophiles and murderers begin their careers as animal abusers. pay attention! So people who are nice to animals are nice to people, are you serious. You have animal lovers that don’t like people because of the color of their skin !!!!!!!!!!!!!!!!!!!!!!!!!!!!!!!!!!!!!!!!!!!!!!!!!!!!!!!!!!!!!!!!! You sound stupid! You dont know anything so why are you speaking?? Such an idiot you are. You know nothing about this situation and you dont know the man so shut up please. no- statistically pedophiles, serial killers and the like were likely to be animal abusers as children. And it aint even duck season. Maybe it was self defense?! Prayers for his family… This needs to stop, too much violence in this place!!! Yet another pointless death. Hope the police catch the bugger who did it. First off I am against any kind of cruelty to animals, and they person who killed the duck should be prosecuted. But “Prayers to his family”? Who do you mean, the idiot who throw the rock and killed the duck, or the duck itself? You holy joes same to just write this stuff automatically. Um that man is NOT an idiot. Take your nasty comments write it on a piece up paper and shove it. Maybe he simply skipped a stone across the pond and it accidentally hit the duck. I really have a hard time believing someone actually managed to kill a duck in the wild on purpose with a thrown rock… please! If he actually did this on purpose he should immediately be snapped up by every professional baseball and cricket team in the world as a pitcher! Guinness book of world records needs to be notified immediately! with so many people going hungry every day ! they should have a least cooked the duck !if it did in fact die by the doings of a rock and not that of bird flu etc. I have seen birds fall from the sky while flying and crash land in front of my car so to assume and post some ones picture is guilty until proven innocent ! they should have also said the name of the persons that took the picture! I am totally against any kind of abuse and think the world of the Bermuda Audubon Society but posting a picture is not letting the police do their job! How sad that yet again, “the superior human” has to pick on a defenseless creature that was unable to defend itself. I do not understand this kind of mind set or how mistreating an animal of any kind, for any reason would make one feel superior or what sick thought is satisfied in carrying out such a cruel deed. Oh my God who the hell cares!!! I could care less about a duck……and I wish someone would kill all of these wild chickens all over this Island !!!!!!!!!!!!!!! I also think dog owners should be more responsible for their annoying barking dogs all day ….. I think your missing the point. Spittal Pond is a nature preserve. The duck is protected under the Protection of Birds Act 1975. Fact man killed the duck with a stone in a nature preserve. Accident or not he should be prosecuted. After the man is question is finished with his interrogation I would personally like to hire him for his marksman services. I have a bunch of feral chickens roun my yard that need to be delt with. I will supply the rocks and cold refreshments. YES!!! I would gladly hire him to pick off the roosters in the trees by my house! Sadly I seriously doubt his aim is that good. Most certainly was a horrible accident. I’m guessing that everyone who disliked our comments doesn’t have a feral chicken problem. I wish you all would stop being judgmental! NONE of you were there and NONE of you know what actually happened! I don’t mean to sound harsh but It’s a damn duck that lives OUTSIDE for crying out loud, anything can happen. The person loves animals so I highly doubt he would randomly kill a duck. Someone gets shot and killed and I don’t hear this much noise! No one posts picture of sexual predators who touch little children.!! Police are investigating. Fowl play is strongly suspected. Ok, are people looking for jail time for killing an animal? Are you serious? The duck doesn’t look like it was stabbed or anything, so what ‘punishment’ should be given for this? It’s Rabbit season… No it’s Duck season. Funny how we have become so sensitive to a situation like this. Not too long ago, these birds along with crows and pigeons were considered pests in Bermuda and shot to keep their numbers in check. Okay a man killed a duck! Whoop-Dee-Doo!!! It’s not illegal! It’s not like he killed someone’s house pet! #JustSaying! I eat duck! I believe its not illegal to hunt in BDA but eat what you kill. Fact is, if this guy was seen throwing the stone that killed the duck then he’s guilty of killing an animal in a protected nature reserve – FELONY, end of! Whether is was unintentional or malicious is moot and only the individual will every truly know. It may be fair to say the outrage (and justifiably) stems from the notion that an innocent and defenseless animal was wantonly killed by a foolish individual who may have had a total lapse of judgement given his surroundings. The island has precious few civilities left and this individual’s actions, if found guilty, are a further assault on those same civilities. It could be reasonably argued that this individual’s action was effectively the same as causing harm, through similar action, to an animal in one of the displays at BAMZ. statistically- pedophiles, child abusers, serial killers and the like we’re likely to be animal abusers as children. That’s a fact.